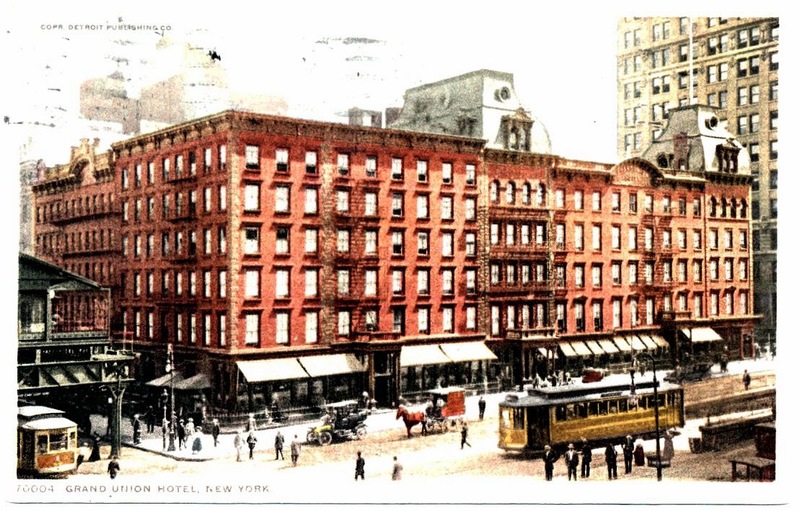 Daytonian in Manhattan: The Lost Grand Union Hotel -- Park Ave and 41st St. 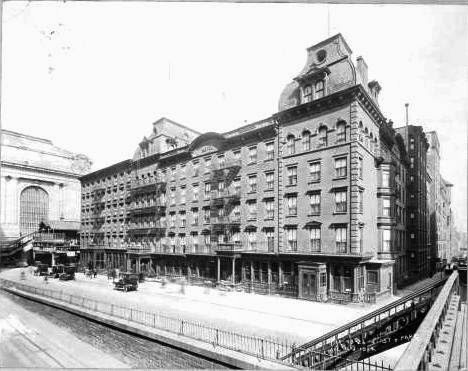 The Lost Grand Union Hotel -- Park Ave and 41st St. In 1868 passenger trains were forbidden by law south of 42nd Street. The 1856 law was intended to reduce accidents between trains and pedestrians. Therefore the three train stations—those of the New York Central and Hudson River Railroad, the New York and New Haven Railroad, and the New York and Harlem Railroad—terminated at 42nd Street. Visiting tourists and businessmen disembarked 45 minutes north of the business district by streetcar. At the time the east side of Park Avenue between 41st and 42nd Streets was lined homes. 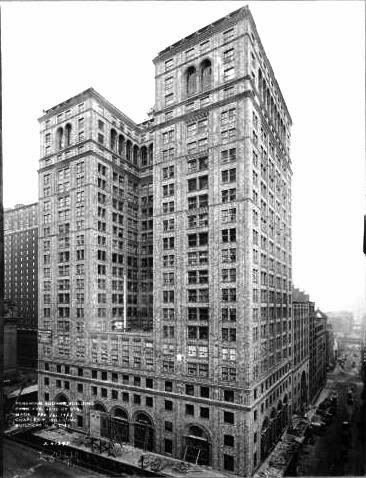 Realizing the need for a hotel convenient to the depots, Samuel P. Shaw and Simeon Ford opened the Westchester Hotel at the southeast corner of 42nd Street that year. It was an unassuming brick-faced Italianate structure that melded well with the residences along the block. Ford’s and Shaw’s scheme was well timed. 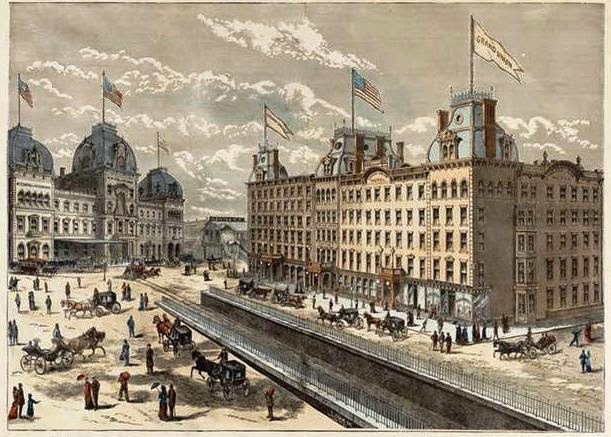 Cornelius Vanderbilt had already begun buying up the railroads and only a few months after the hotel opened The Sun, on February 5, 1869, commented “Vanderbilt…wants to be considered the ‘Colloesus [sic] of Rhodes’—that is to say, of the rail-roads.” He began buying up property between 42nd and 48th Streets, and Lexington and Madison Avenues as he planned his ambitious Grand Union Depot. The name was changed at some point to Grand Central Depot and the magnificent combined station opened in 1871—steps from the Westchester Hotel. Ford and Shaw purchased the adjoining property and expanded the hotel. And expanded. Later the New-York Tribune would recall “Mr. Shaw…although not a hotel man, kept the Westchester open and from time to time built additions to it.” Eventually the hotel—renamed the Reunion Hotel and later the Grand Union Hotel—encompassed the entire block. The piece-meal growth of the Grand Union resulted in an eccentric architectural pile. The original building and the first addition matched. But taste in architecture moved on and the southern annexes appeared as two mansarded pavilions flanking a central five-story section with nothing in common with the older hotel. Simeon Ford was well-known as an after dinner speaker and as a collector of prints of sporting scenes and of old New York. Samuel P. Shaw was a collector of American paintings. Their relationship was strengthened in 1883 when Ford married Shaw’s daughter. All modern urban hotels were lit with piped gas. The innovation posed a problem when rural guests, accustomed to blowing out kerosene lamps or candles, would do the same with the gas jets. The result was wasted gas or, much worse, a dead guest and the possibility of explosion. In reminiscing about the early days of the hotel, Simeon Ford decades later related a story to a reporter. “I remember once when a nice, benevolent-looking old gentleman had registered and was about to go to his room I stepped up to him and with an engaging smile, I said: ‘My dear sir, pardon me for addressing you, but from the hayseed which still lingers lovingly in your whiskers and the fertilizer which yet adheres to your cheap though serviceable army brogans I hazard the guess that you are an agriculturist and unaccustomed to the rules to be observed in one of New York’s palatial caravansaries. Permit me, therefore, to suggest that upon retiring to your sumptuous $1 apartment you refrain from blowing out the gas, as it’s the time-honored custom of the residents of the outlying districts, but turn the key, thus. “He glared at me and went his way, and I noticed that the clerk, who had been standing by, had broken into a cold sweat. The smell of illuminating gas resulted in a much less humorous story on February 21, 1894. At 10:00 that night a woman got off the Boston express train and checked into the Grand Union. Giving her name as Mrs. Jennie Miner, she was handed the key to Room 101. 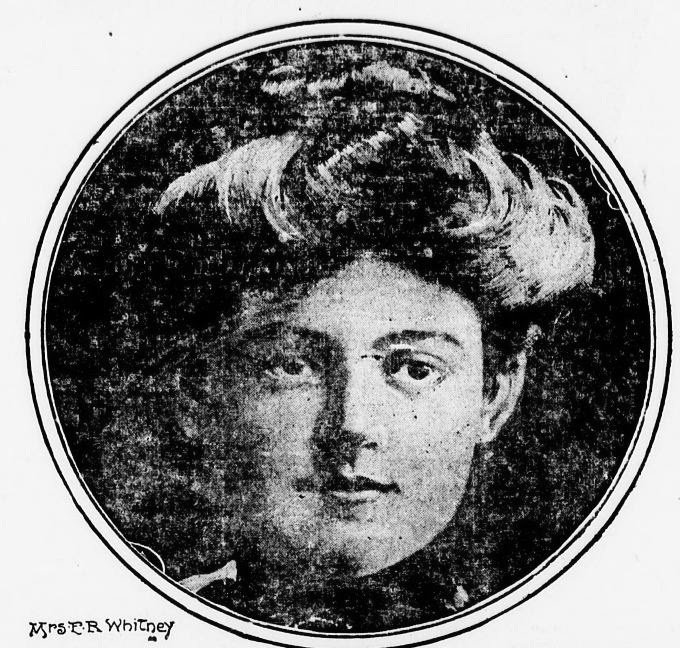 The woman, whom The Evening World described as “a good-looking blonde of about thirty-three years,” was taken to Bellevue Hospital where she died. Investigators assumed that Miner was an assumed name and it appeared she was down on her luck. “Her clothing indicated refinement, although it was of a fashion that prevailed many years ago,” said the newspaper. The writing room of the Grand Union was decidedly masculine. Mrs. Chickering was in Washington, so the congressman was alone during this stay. Monday evening was rainy and he complained that the pain of his rheumatism was “almost unbearable.” A waiter brought his dinner to his room that night. It was the last time Chickering would be seen alive. The successful hotel warranted yet another addition in 1901. That year, in March, Simeon Ford and Samuel Shaw commissioned architect James B. Baker to design a $237,000 eight-story annex on 42nd Street. 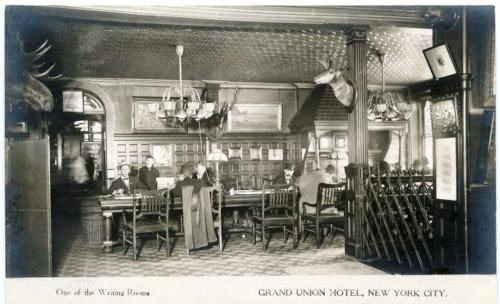 With the addition the Grand Union Hotel was one of the largest in New York City. 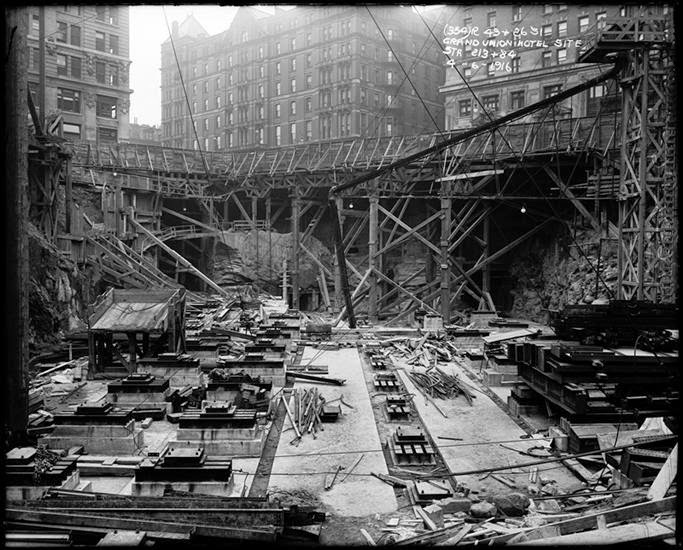 On January 27, 1902 excavation work was underway for the subway trench below Park Avenue at 41st Street. 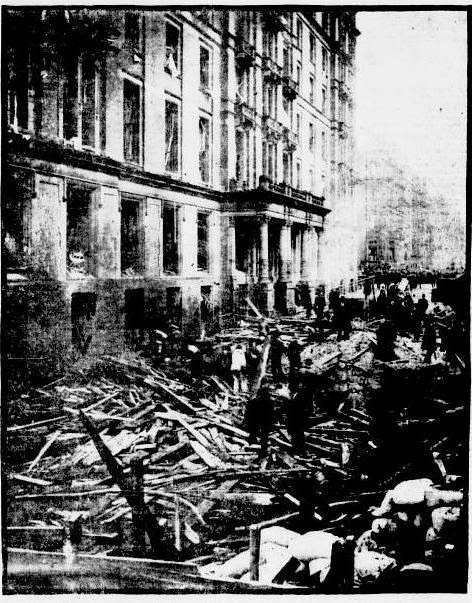 At noon workmen attempted to dry rain-dampened dynamite by igniting loose powder. The imprudent idea resulted in half a ton of dynamite exploding. P. F. Verdon was a clerk and was blown across the room and against a wall. He received a bad scalp wound. 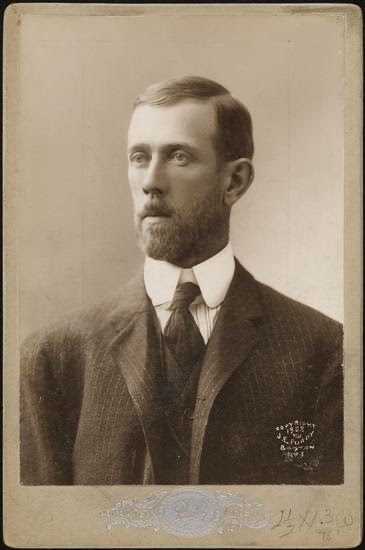 Among the injured guests were Jefferson J. Stanton whose face and hands were cut, Benjamin R. Stark of Jersey City who was cut by glass and suffered a broken right arm, and William Thompson who was cut. A pedestrian, Albert J. Brockley, was passing the hotel when a one-pound rock struck him on the ankle. Another rock, this one 50-pounds, smashed through the opening of a hotel window that had not yet been replaced from the last explosion. A postcard reveals the several sections--the original two at the near corner, the next buildings with their mansard caps to the south, and the 1901 addition at the far left. In the spring of 1905 22-year old Anna Bennett was working at the Grand Union Hotel at the telephone switchboard. She earned a respectable salary of between $8 and $10 a week—about $250 today. But things were about to change for Anna Bennett. The couple was married on Sunday afternoon May 7. “As a marriage settlement Mr. Whitney agave his bride $100,000, and in addition to that $15,000 for her trousseau. A check for $500 and a diamond sunburst were her wedding tokens,” said The Evening World. The year 1909 was a dismal one for the Grand Union. In February First Lieutenant John J. Moller, a infantry officer on furlough, checked in. “He was quiet and almost unnoticed, and made no acquaintances during his few days’ stay at the hotel,” said the New-York Tribune on February 23. On the night of February 22 he shot himself in the right temple in his room. An equally gruesome scene would play out on September 13 that year when wealthy John W. Castles severed his jugular vein with a single razor stroke. The 51-year old was president of the Union Trust Company. He and his family lived at No. 540 Park Avenue and maintained a country home in Morristown, New Jersey. He checked into the Grand Union for the sole purpose of committing suicide. Within two years the hotel was gone. But the site would sit vacant until 1920. Then on Wednesday, May 26 at noon, the property was sold at auction by the City of New York. 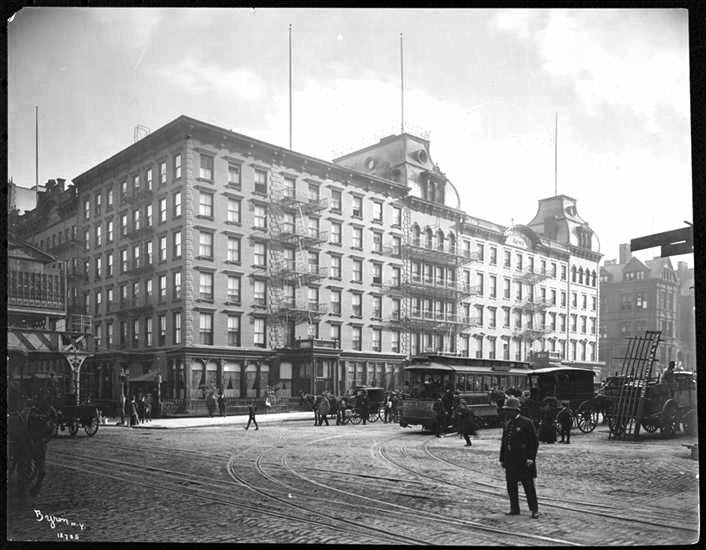 Where the Grand Union Hotel had stood rose York & Sawyer’s masterful Pershing Square Building which survives today. Loved this, thank you! Simeon Ford and Samuel Shaw are my Greatx4 and Greatx5 grandfathers respectively, so it was nice to read of their long lost NYC landmark!